Those who are trying to make their custom-made iMacs may want to look at Envision's new 24" G416 widescreen LCD. The Envision G416 has a 1900 x 1200 resolution, 16:10 aspect ratio, 5 ms response time and 3000:1 dynamic contrast ratio. 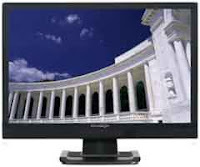 The Envision G416 LCD also supports RGB Analog and DVI-D signal input and is also wall-mountable. The Envision G416 will allow you to watch your DVDs in their natural widescreen format. The Envision G416 LCD costs around $399.99. Just an FYI on this monitor....I went through six at a local Fry's and every one had at least 1 dead pixel, a couple had multiple. They're Made in China where apparently QC doesn't exist. I would definitely think twice before ordering one of these online, you're almost guaranteed to get a defective one.....unless you can live with a dead pixel or two. FYI, Dell's, Apple's, & nearly everything else is made in China, so lack of quality control is Envision's fault. they are on sale this week at Circuit city for 289 after a 40 mail in and ($330 without it). not sure if they are good or not.